When building a marketplace it takes a serious amount of work and management, considering sites like Etsy and eBay process millions of transactions each and every day. These sites show that developing a unique online marketplace is a viable business, considering so many of them bring in millions, if not billions of dollars. Even a place like Amazon is considered a marketplace, since users can go on the site and drop products from multiple vendors in a single shopping cart. 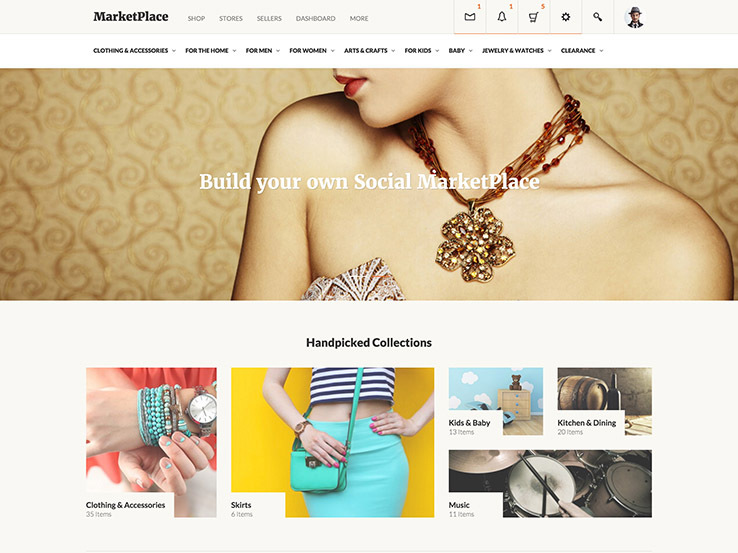 And now you can make your own with a simple marketplace WordPress theme. What Are Things To Look For in a Marketplace Theme? Marketplaces are some of the most complex eCommerce shops online, so it’s important to understand which elements are most important for your own website. To start, you’re going to need a responsive layout. Next, it’s nice to have a system that connects with plugins like WooCommerce. This way you don’t have to worry about how payments are being processed. Oh yea, and you’ll want a solid blog to boost the effectiveness of your SEO. Another primary feature is a shopping cart that lets customers shop from multiple vendors in one visit. This way, they only have to checkout once, but the vendors all get the money they deserve. Who Should Consider Buying One of These Themes? Anyone could start a marketplace if they wanted to. However, it’s not uncommon for niche blogs to take on the challenge. For example, a web design blog might want to start making money. If that’s the case, why not make a marketplace for people to stop by and purchase themes or something like that? The customer base is already there, and you don’t have to spend much time in terms of SEO, since your blog is already doing the legwork. Social MarketPlace is the perfect solution for a WooCommerce powered MarketPlace. The theme integrates with WC Vendors, which is probably the most popular multi-vendor plugin for WooCommerce available on the market. The design is beautiful with a big focus on user experience. The theme is packed with features. Your vendors can manage their store, brand it, create products, create coupons, manage feedback from customers and whole other set of things. Customers can communicate with vendors, they can track their order, view their order history, and much more. A beautiful dashboard is provided to the vendors, so they can track their orders, commissions, and overall performance. 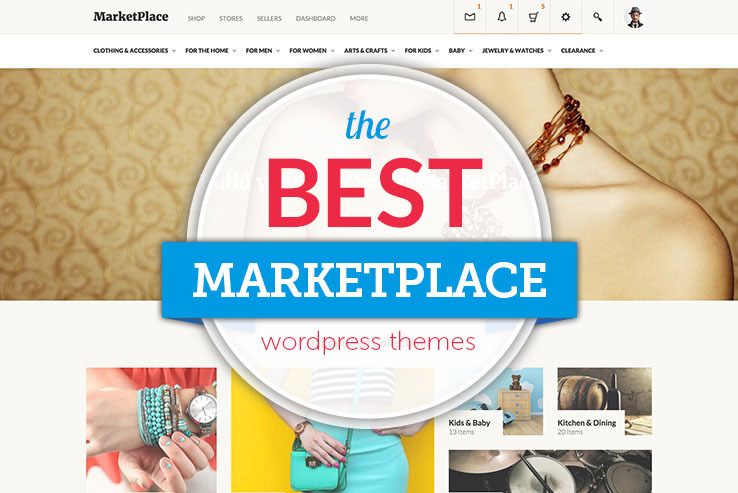 Your vendors will be amazed by the power of this theme. Social MarketPlace is more than just a marketplace theme. The theme features some great social functionality, thanks to the integration with BuddyPress and bbPress. Not only does it shine on the e-commerce side, but it’s just as powerful when it comes to the social aspects. Make sure you check out this great theme. Jobster is definitely the most advanced and feature rich Service Marketplace Theme, developed and maintained by the people who run a successful online marketplace of their own. Currently powering over 250 websites, and processing 40,000+ transactions per month, Jobster development team has a proven track record of being capable of providing stable turnkey platform for companies and individuals really serious about getting into the online marketplace niche. On top of all of the awesome features included, such as multi-currency and multi-language support, level and sales volume based commission system, 13 payment gateways with the API provided in case you wish to integrate your own, they also have a clever system in place where clients can submit feature requests, or vote for the ones they would like to be considered for future development. Last but not least, automatic theme updates and support are included which each license purchased for a truly hands-off experience when it comes to maintenance, which is especially useful for users with limited technical knowledge or those looking to spend more time running the business instead of dealing with the technical aspects. 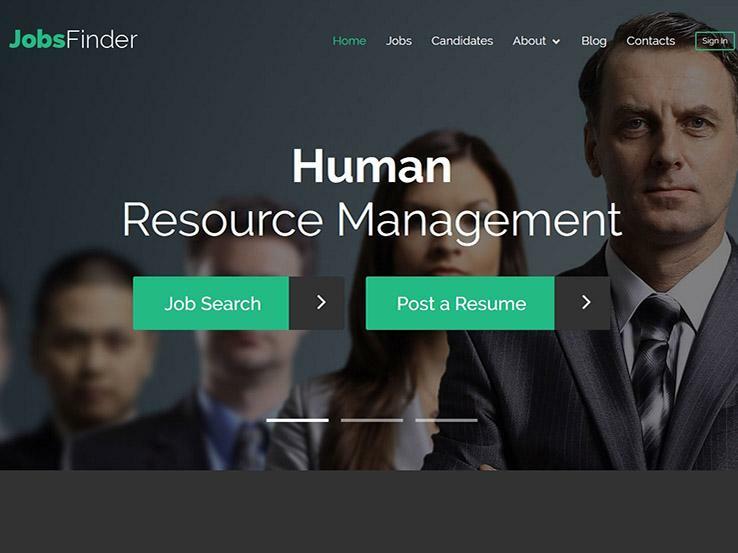 Jobs Finder is a simple yet functional template for a job portal. The design is fully responsive, meaning it will scale down to any screen size. The design of the homepage has a clear structure. Full-width slider serves as an eye-catcher. The content blocks on the page are visually separated from one another. This outlines different types of information and makes it easy to comprehend. Parallax scrolling adds dynamics to the layout, while background video gives you an additional possibility to diversify the presentation of your company. Using the charts, you can visualize the data and make it more demonstrative. When it comes to the functionality, the theme provides you with handy solutions to multiple problems. Thus, Job Board Plugin makes it easy to add and manage job offers on your website. Full social integration assists you in creating a strong online presence. The theme comes with a set of ready-made pages that can be fully customized. A vast library of the shortcodes enables you embedding new content into your website without any difficulties. 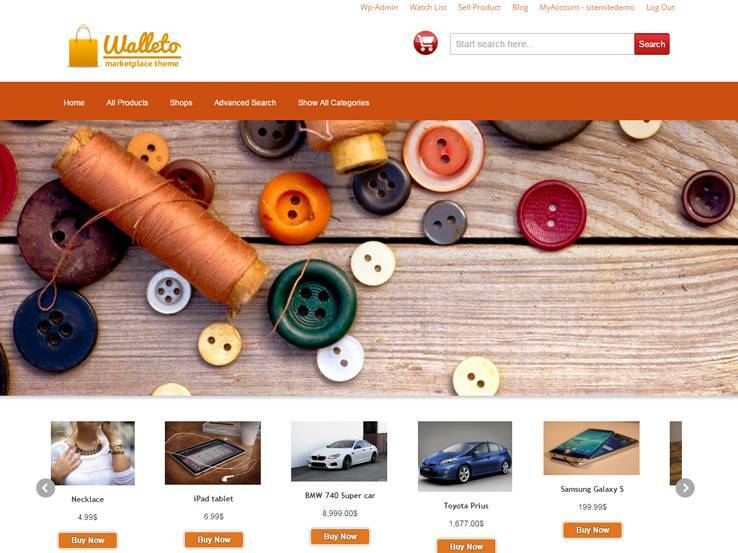 he Walleto theme is a beautiful theme with responsive design for viewing on mobile devices. The theme allows you to open your own fully featured marketplace with a product custom post types and featured products on the homepage. The best part is that every user who comes to the site gets their own profile, allowing them to track what they have bought in the past and even re-download something if they bought a digital item. Users can also control their own finances by linking credit cards. Localization is available so you can make your shop available internationally. The admin panel gives you total control over the way the shop runs and looks, with settings for images, quantities, shop details, and colors. The shopping cart functionality allows people to drop in products from multiple vendors. When they’re ready to checkout, the funds are distributed to the specific vendors. Private messages are offered for customers to ask questions to vendors. Each user has her own wallet, where they can deposit the money and manage various payment methods. Social integration is rather powerful and multiple payment gateway support makes it easy to collect and process payments. Along with email notifications and several monetization tools, the Walleto WordPress theme has everything you could want for a marketplace. 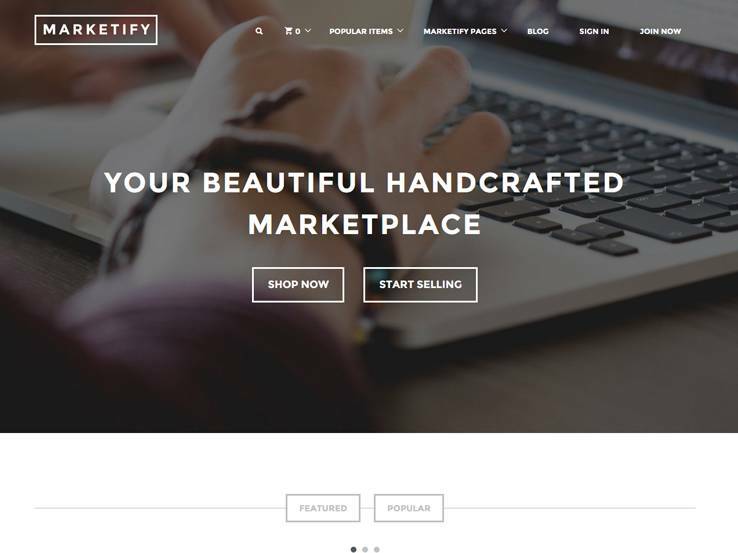 Consider the Marketify theme if you’re interested in one of the easiest methods for turning your regular website into a full-fledged online market. This gem provides support for both digital and physical product sales and it integrates with the Easy Digital Downloads plugin. The theme is completely responsive and looks great even on tablets and phones and it also features a highly customizable frontend for changing colors and backgrounds. Each vendor receives their own page to showcase products. The best part is the rating system, where users can chat about and rate the products they really enjoy. The Author dashboard is where vendors can manage everything and even share blog posts about their products since they can apply to be an author on your site. Once approved, they have all the tools necessary, including image uploads, description possibilities, and obviously the ability to share their products and talk with customers. The digital store is optional, but as stated before, it works by implementing Easy Digital Downloads. After that, you can accept payments to sell items like audio clips, movies, and eBooks. The Marketify pages are rather vast, including templates for blogs, author profiles, pricing, and more. Feel free to insert social media sharing and follow buttons to improve your social media presence. Overall, this is one of our favorite themes for launching and scaling a true online marketplace. 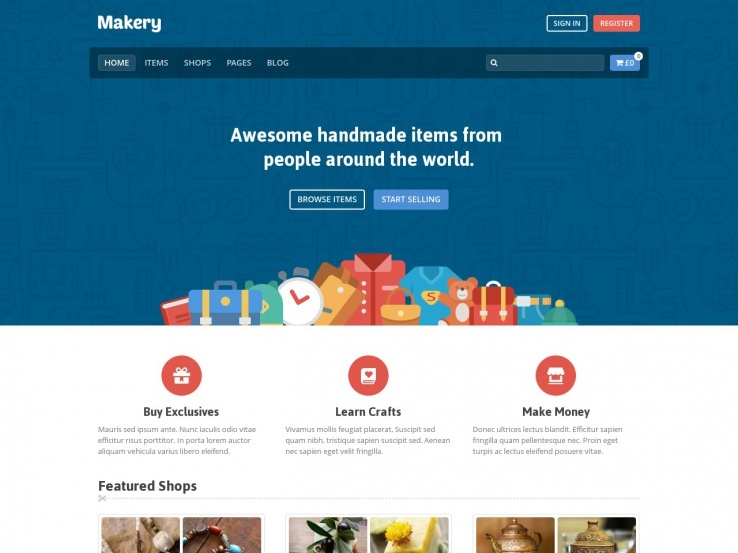 The Makery theme has a strong feature set for those creating online marketplaces. It all starts with the mobile interface, which goes along with the way users are buying online nowadays. The unlimited shop count means that there’s no end to the amount of money you can make. Shop commissions are distributed after a user buys something from the marketplace, which is wonderful for everyone involved since customers can still go through a quick checkout process and vendors still get their money. Vendors and users can also withdraw their money at any time, turning your marketplace into a more fluent, transparent system. Profiles are powerful and easy to manage. Not to mention users can also mark certain vendors as their favorites thanks to the favorite buttons. A standout feature is the Facebook login module, which helps get people logged into your marketplace within seconds. They don’t have to memorize a completely different password for your site. This is a WooCommerce theme which means it’s easy to sell both physical and digital products. The backend features various tools for customizing anything from your logo to the color scheme. Finally, the theme provides a beautiful shortcode generator, allowing for just about anyone to implement more complex design elements like buttons and columns, all without having to know any code. 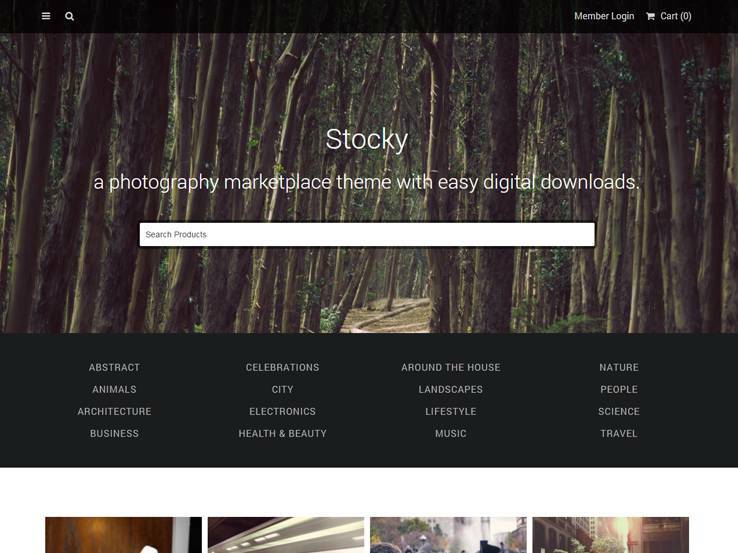 The Stocky theme is a great choice for those looking to sell stock photos in an online marketplace fashion. Although you’ll have lots of competition, it’s possible to make a dent in the stock photo industry niche. The theme has a responsive design which is perfect for viewing on tablets and other smaller devices. It automatically generates photo galleries so you don’t have to organize thousands of photos that would surely be on your site. The frontend submission modules work rather well, and the wish list tool comes in handy for those users who are constantly buying stock photos for their business or blogging needs. Stocky is compatible with several review plugins, encouraging users to rate the photos on your marketplace. It’s a great way to build social proof and create a community around your website. Several dedicated pages allow for some variety on your marketplace. The Stocky theme includes contact, vendor portfolio, login, and home pages. Each of these is fully customizable, through a beautiful interface suitable for both beginners and advanced users. The color picker tool is a nice touch since it allows you to easily find the perfect colors for your buttons and tabs. The Easy Digital Download plugin integrates flawlessly with the Stocky theme, and a translation file is provided so you can translate your website. Various social media icons are included, making it easy to share your content online and to connect with your audience on their preferred social media network. 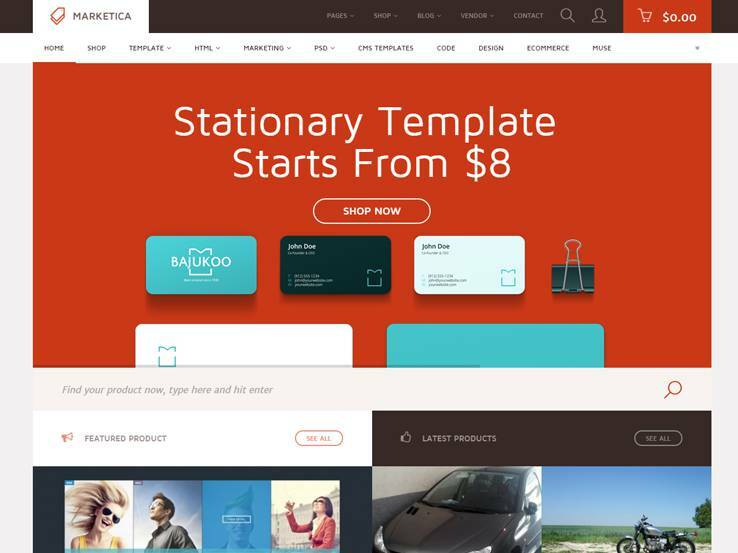 The Marketica WordPress theme has the tools you need to build your own small or large marketplace since the responsive theme works with WooCommerce. Therefore, you know that tons of support comes along with your shopping cart software and you don’t have to worry about staying organized and secure with your products. Both digital and physical product sales are possible. What’s interesting is that this theme relies on several plugins for it to work to its potential, but all of the plugins run fluently when combined with Marketica. The plugins include WC Vendors, Dokan Multivendor, Woo Product Vendors, Socio Multi Vendor, Visual Composer and Revolution Slider. That’s just a few of the plugins that support the Marketica interface, but it’s also worth mentioning that this theme provides a solid translation file so you can easily expand your reach and make your shop available to users across the globe. Some other Marketica theme features include the ability to change your logo and favicon, improving your branding along the way. On top of that, custom headers and backgrounds are all accessible and easy to change from the backend and the white label branding is a handy feature if you’re using Marketica for your clients. Finally, several post formats add variety to the Marketica theme including galleries, links, quotes, and images. Squarecode is one of the best themes if you’d like a marketplace theme that’s compatible with Easy Digital Downloads. This theme not only looks sleek, but it also features a responsive design that looks and works great even when viewed on tablets and phones. You can easily build your own store and sell both digital or physical products you’d like. What’s cool is that your vendors can also sell services if they want. The Squarecode theme offers the ability to share career listings, along with tools for highlighting your past work in a portfolio. The theme also includes a staff profiles area for featuring your employees and highlight their work. A child theme is included with the Squarecode theme, which helps with customization and making changes to your theme. A translation file makes translating your website easy. Choose from a boxed or full width layout for your marketplace store and consider processing payments through a wide variety of payment gateways. 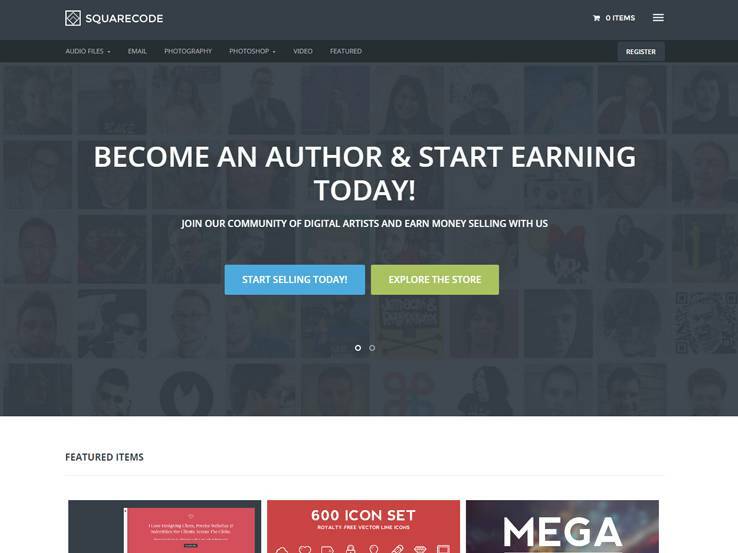 Overall, the Squarecode WordPress theme is a wonderful choice for a marketplace. 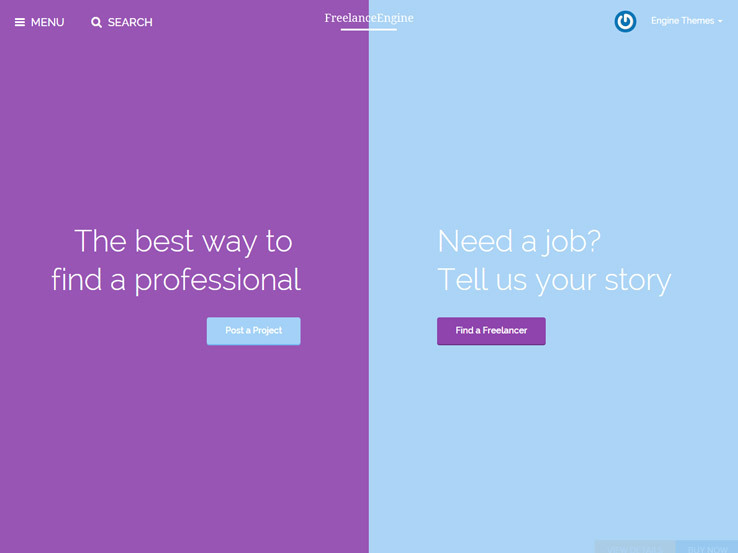 HireBee has a clean, modern, and responsive design and it looks similarly to the Freelancer.com website. Overall, this means that webmasters going for this theme are looking to make a marketplace that provides connections between workers and employers. It’s not necessarily a job board, but rather a place to locate freelance work and get reasonably priced jobs for your own company. Choose between a boxed or full-width layout and enjoy the responsive nature of your theme. Eight preset colors are a nice starting point for branding your website. However, all of the preset colors can be customized and you can choose from unlimited colors to create the perfect color scheme for your marketplace. The Revolution Slider plugin is included, helping you build a clean slider for highlighting the most recent jobs. Custom styling is there for more advanced developers and the translation files ensure that people from all over the world can understand the content on your marketplace. If you’re familiar with Freelancer, you’ll know that this type of website is rather complex, allowing people to search for jobs, post requirements, and manage their resumes on the backend. Two profiles are accessible: One for employers and another for job seekers. A latest projects feed is showcased on the homepage and users can submit their credentials to try and win jobs from the employers. Another notable feature is the social media support which is built right into the theme, which helps visitors share your content on various social media platforms. Along with favorites, notifications, email support, and more, the HireBee WordPress theme is pretty much an exact replica of the Freelancer website, so if that’s what you’re looking for, you’ve found your solution. 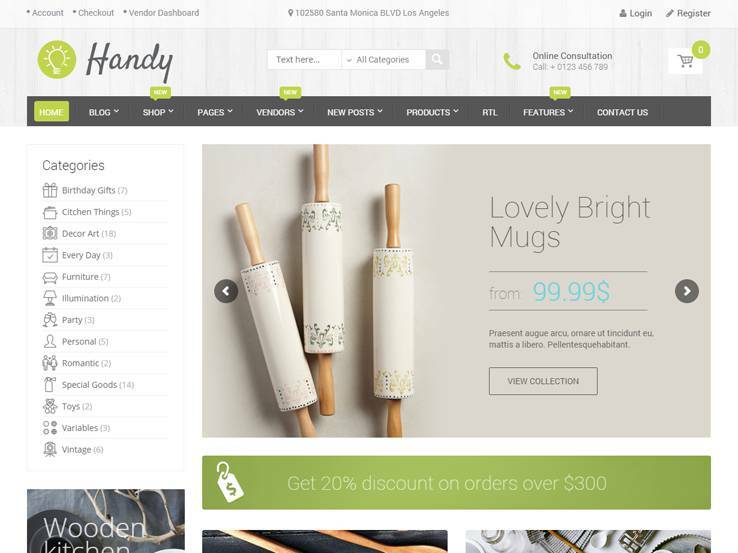 The Handy WordPress theme is a rather creative marketplace theme with simple features that allow you to monetize your website. The vendors have their own dashboard for creating sales pages and getting their products to customers. The theme has a responsive layout which helps when visitors view your website on mobile devices, while the entire homepage is pretty much constructed with the help of widgets. The Handy theme is a rather powerful theme because you’re not going to need that many plugins after you have it all setup. It includes quite a few beautiful social media buttons for connecting with customers on other platforms. You’ll also find a nice featured products slider that pulls from multiple vendors on your website. Overall, it’s a solid theme with all of the tools you’re going to need to build a strong marketplace. 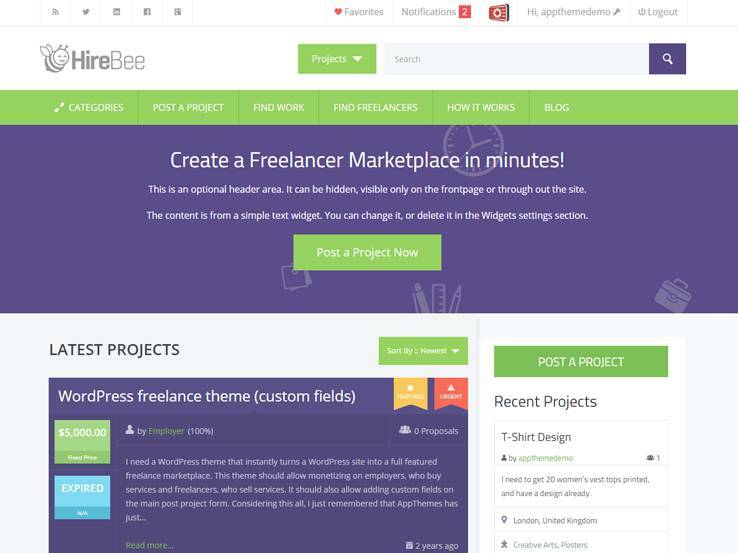 The Freelanceengine marketplace theme is another theme that’s similar to the Freelancer.com framework. Basically, it sets up a platform for users to post and bid on certain freelance or full-time jobs. Employers and job seekers can build profiles and list credentials and information about themselves. The theme serves as a powerful income tool since you can collect a certain percentage from each transaction that goes down. Safe and easy project bidding is the main feature in the Freelanceengine theme, so anyone who comes to your marketplace can rest assured nothing will go wrong. The responsive web design is a must-have, while the smooth escrow system makes sure no one gets taken advantage of. Tons of reports and analytics are provided to understand what’s going on with your site and multiple payment gateway options ensure that you get paid on time and in a reasonable fashion. The project submission system is sleek and smooth where everyone gets a notification when something goes live. If a user bids on a project, they are kept up to date on how the bidding is going. Job seekers can communicate with different employers and employers can manage projects in a specific area on the backend. A review system is provided as well which is useful for providing feedback on both job seekers and employers. Dispute management is a huge part of any job site, so the Freelanceengine theme includes a comprehensive process for users to submit their disputes and talk to you about resolving the issues. 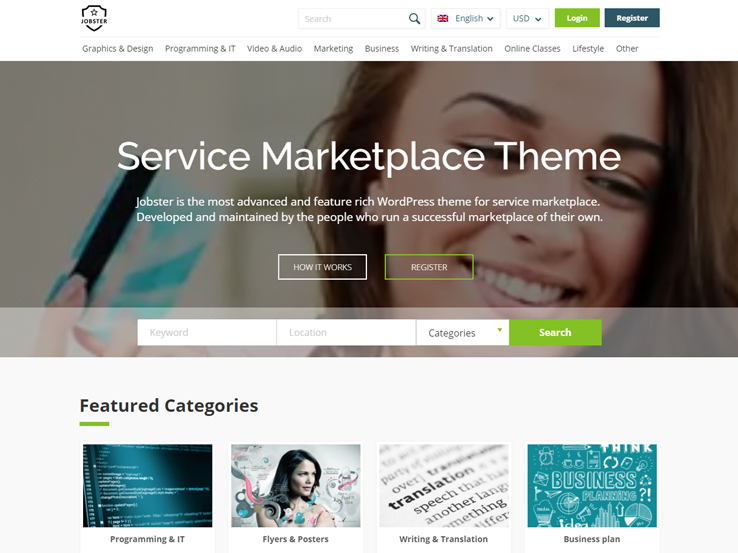 Along with a premium slider, advanced search, and some drag-and-drop functionality, the Freelanceengine WordPress theme is a feature-rich theme for running a job marketplace. 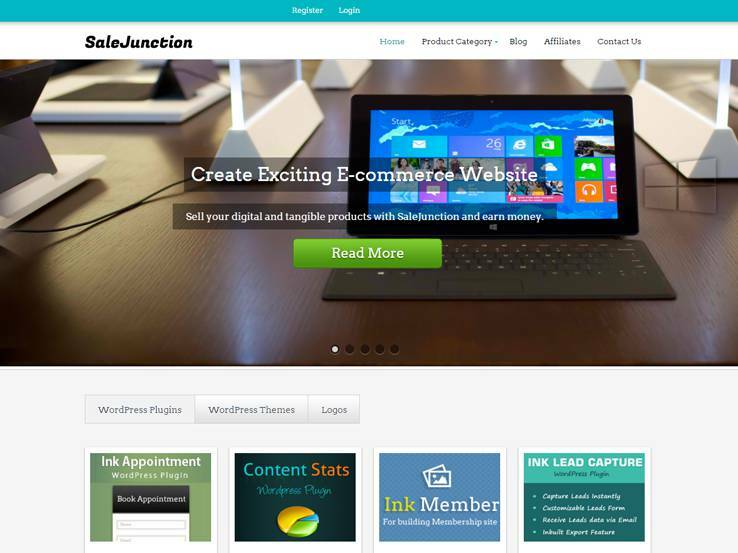 The Salejunction WordPress theme allows you to handle a full marketplace regardless of the industry. The theme has a responsive design for all device sizes and you can sell physical and digital products. 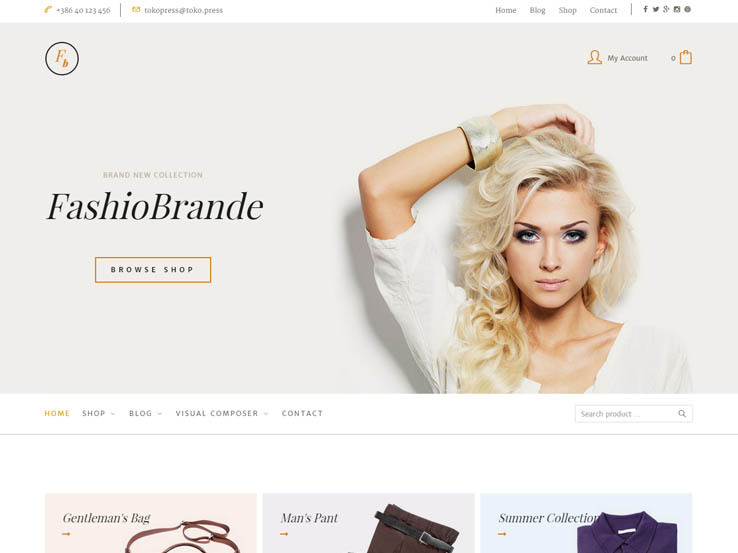 The beautiful design helps maximize the number of sales you receive and this theme connects with both WooCommerce and Easy Digital Downloads. Both of these plugins are free and combine well with WordPress. Adding products is easy for both you and the vendors selling to customers. Several widgets are available for the homepage, so if you’d like to have a featured products module, it only requires you to drag and drop the widget in place. The theme includes a number of color schemes and the logo upload module on the backend makes it easy to build brand recognition. Along with a footer text section, elegant typography, and some nice sliders, the Salejunction WordPress theme is a smart choice. 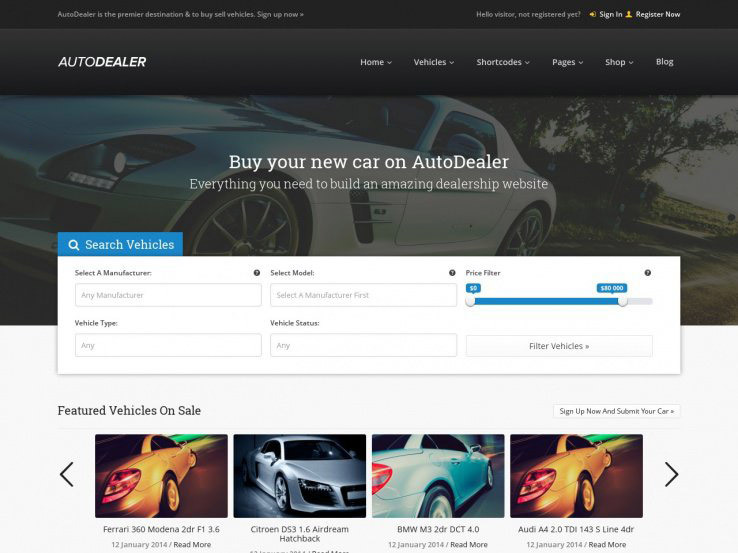 The AutoDealer theme offers a versatile and powerful solution for car dealer marketplaces. It brings many features including a front-end submissions user dashboard, payment packages for car dealers, WooCommerce integration, and more. Car dealers can create accounts, buy packages and submit their vehicles, while regular users can favorite the car listings they like, all from the front-end. A search function makes it easy for users to find cars of their liking. We also like the email notifications feature that notifies the site admin and users when a new listing is submitted. 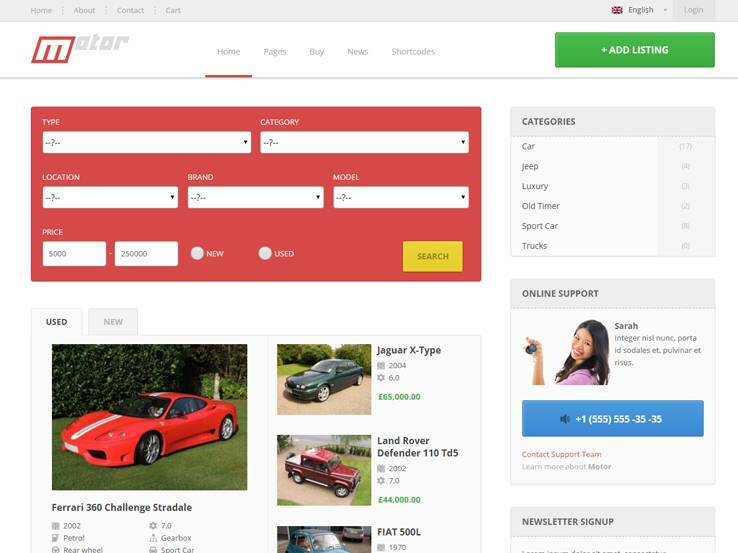 The Motor theme can be customized to suit a wide range of marketplace sites. It integrates nicely with the WooCommerce plugin, providing access to a wide range of powerful and flexible eCommerce features. An advanced search box lets users find listings of their interest quickly, while a large “add listing” button invites vendors to submit new listings. Translation tools make it possible to localize your site or target an international market. Use the elegant blog to share your knowledge and generate more traffic to your website. Besides, you’ll find a newsletter module to capture email addresses and run email marketing campaigns, several layout designs, page templates, and shortcodes to easily add different elements to your site without much coding. 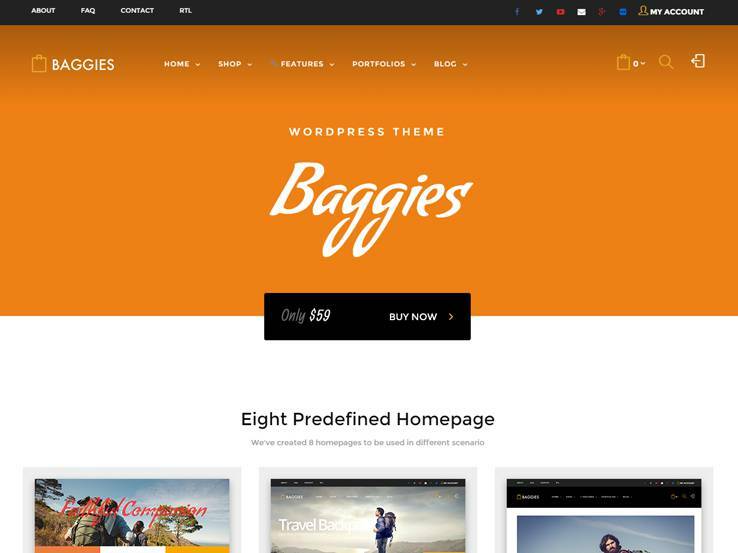 The Baggies theme comes with several attractive homepage layouts, all of which are responsive for a perfect display on mobile devices. It integrates perfectly with the WooCommerce plugin, so you get all the needed eCommerce features including a shopping cart, payment and shipping options, product pages, wishlists, and much more. Vendors will have their own user store pages and store lists. Besides, there’s a beautiful blog section to help generate more traffic to your online marketplace, translation tools to easily reach a global audience, custom widgets, and several page templates to get you started. 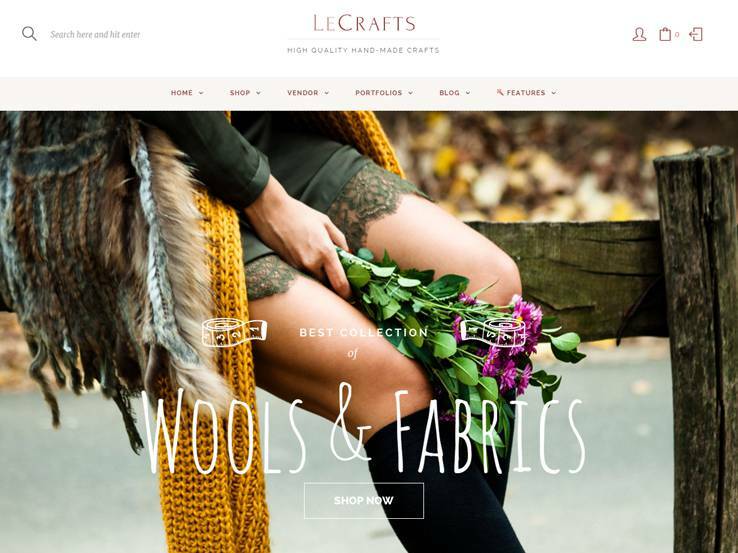 The Lecrafts theme makes it easy for your vendors to create their accounts and store lists and add their merchandise. Regular users can also create their accounts and have access to wishlists, add goods to their shopping carts, track their orders, and more. WooCommerce integration gives you access to many useful features including product pages and variations. The template comes with 7 ready-made homepage layouts to get you started, several page templates, and a blog to enhance your search engine rankings. Moreover, you’ll find lots of customization options to make the theme your own, translation files, easy-to-use drag-and-drop elements, and social sharing functionality to help spread word about your online marketplace. 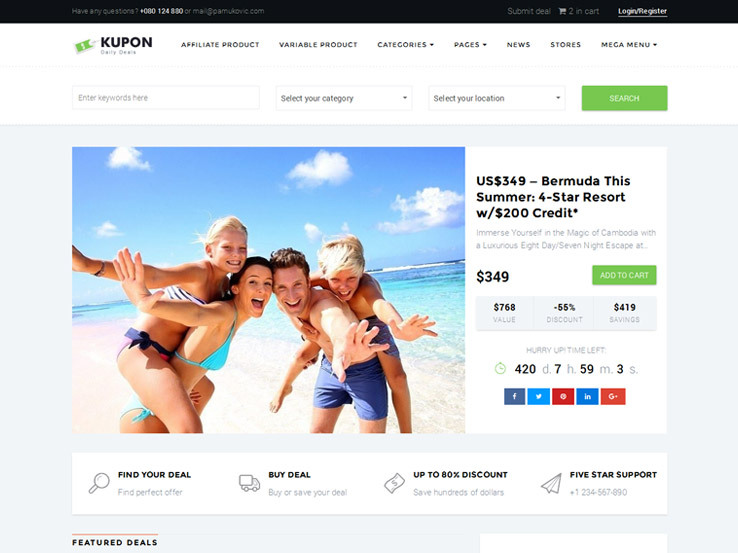 The Kupon theme is a smart choice for daily deals marketplaces or classic shops for both physical and digital products. The template implements eCommerce features using the WooCommerce plugin, while marketplace functionality is provided by the WC Vendor plugin. Vendors can create accounts and submit their listings from the front-end. The Visual Composer plugin provides a drag-and-drop interface for creating your pages. It comes with custom widgets that allow you to easily add elements without touching code. Moreover, you’ll find social media integration and a blog to help generate traffic to your site. The Pasar theme allows you to sell your own products along with those of your vendors. Vendors can create accounts and add their own products, or you can assign them products yourself. They’ll have their own profile pages and dashboards to manage their listings. Integration with the WooCommerce plugin provides eCommerce functionality such as shopping carts, order tracking, payment gateways, and product variations. Besides, the template comes with sliders, image banners, and carousels to showcase product photos, as well as a drag-and-drop page builder for creating custom page layouts of your own. Along with customization options, post formats, translation tools, and social icons, the Pasar theme is a solid option to go with. The WordPress Project Bidding theme is designed for creating freelancer or job marketplaces. Users can register either as clients or workers. 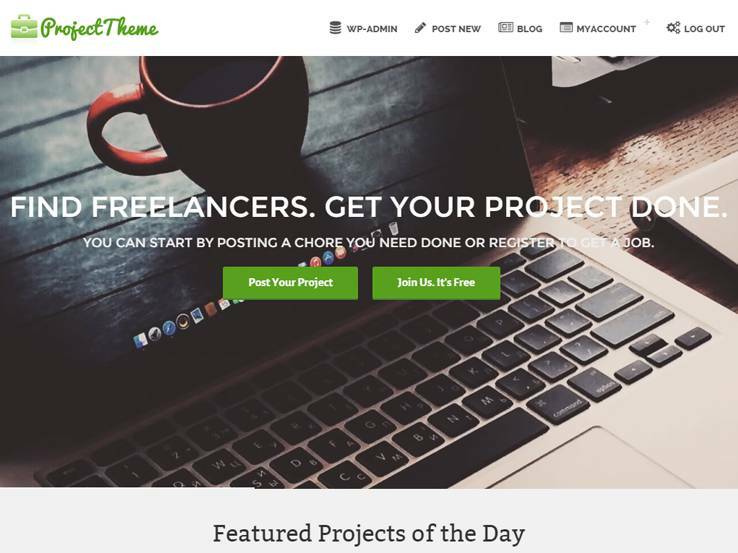 Clients can then post their projects and browse freelancers. Workers, on the other hand, can search for relevant jobs and apply. Users can easily manage their accounts and payments and send messages to each other. The homepage features a well-organized design with sections to display featured projects, freelancer categories, latest projects, job locations, and more. In terms of monetization, the theme provides a variety of ways to make money from your site. You can charge listing fees, featured listing fees, private bid fees, a percentage or fixed fee out of each sale, and membership fees. Furthermore, there’s an escrow system to protect funds, social media integration, and a blog to share information and generate more traffic. 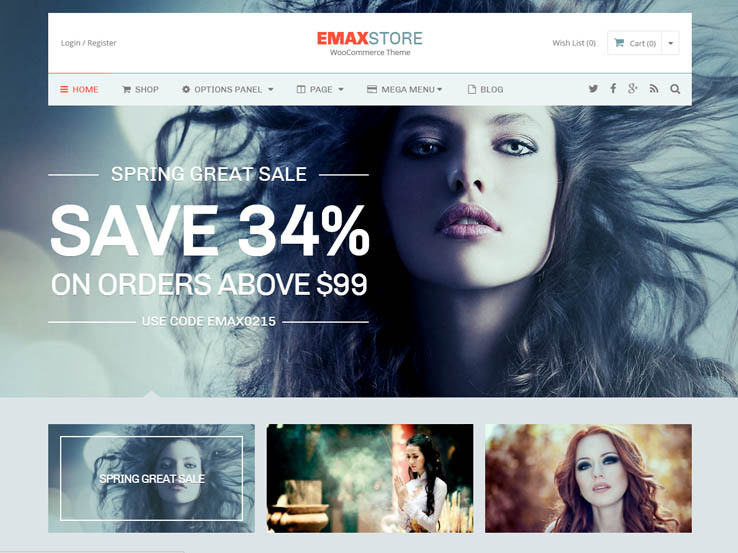 The eMaxStore theme comes with a beautiful, well-thought design aimed at helping you generate more sells from your online marketplace. It comes with all the standard eCommerce features such as a shopping cart, a streamlined checkout process, product sliders and carousels, product comparisons, wishlists, and more. A user-friendly theme options panel is available, giving you control over the way your site looks and works. Besides, you’ll find translation tools so you can easily reach a global audience, a blog to help you generate more traffic, unlimited color options and fonts for branding purposes, and social icons for people to easily connect with you on different platforms. Thank you, did you find a favorite? in case thatI have multiple vendor in my site (preferably handy theme), is it possible to pay to seller after buyer confirmation or after passing a period of time, for example 1 month after order? Which theme are you referring to?